Lahouari Addi is emeritus professor of sociology at Sciences Po in Lyon, France. He is the author of the chapter on Algeria in a book edited by Ellen Lust, The Middle East (CQ Press, 2015), and his most recent book is Radical Arab Nationalism and Political Islam (Georgetown University Press, 2017). 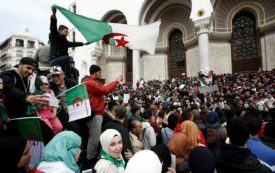 The most striking feature of today’s uprising is that the gigantic rallies are peaceful and socially mixed, with men and women, old and young, taking part—and adamant in their resolve to get rid of the regime.